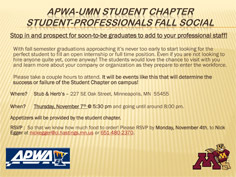 Mark your calendars and plan to attend the APWA Student Chapter Student-Professionals Social Outing on Thursday, November 7 at Stub & Herb’s on the University of Minnesota Twin Cities campus, starting at 5:30 and going until around 8 .pm. Please download and post the APWA-MN Student Chapter Student-Professional Social Outing flyer (pdf) in your office and share the news with your co-workers. With fall semester graduations approaching, it’s never too early to start looking for the perfect student to fill an open internship or full-time position. Even if you are not looking to hire anyone quite yet, come anyway! The students would love the chance to visit with you and learn more about your company or organization as they prepare to enter the workforce. Please take a few hours to attend the event. It will be events like this that will determine the success or failure of the Student Chapter on campus. We hope to see you there. Thursday, November 7, 5:30- 8 p.m. Please RSVP by Monday, November 4 to Nick Egger at nickegger@ci.hastings.mn.us or (651) 480-2370 so we can make sure to order enough food.